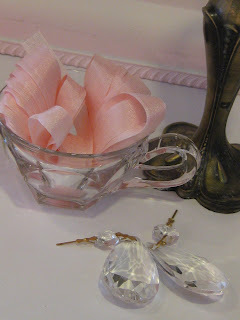 Bellamere Cottage: Easy Peasy Pink Saturday Tutorial! Oh yes! You'll want to head right on over to see all of the other pretty pinks. And now.......without further ado!......THE TUTORIAL! 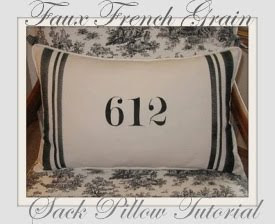 This is such an easy little project....I do love something quick and satisfying! 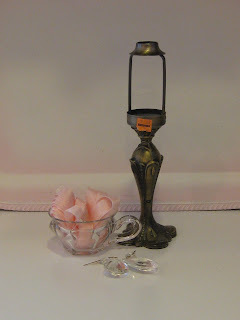 If you don't have some sort of metal candlestick around the house, just zip on over to your handy, dandy thrift store and pick up something cute....this one is from Partylite....and was only$2.99, I think! That little top gizmo just screwed right off. You'll also need a nice, clear punch cup. I think mine was about 49 cents....two prisms, about a yard of pink (or whatever color you fancy!!) 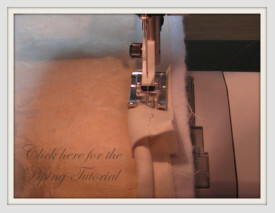 seam binding. This is Midori's ballerina pink. It's my FAV!! I had some old 527 glue out in my stash, and that seemed to work quite well....and a little tealight of your choice. And, pretty darn cute, don't you think??? 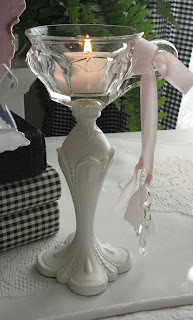 I have made several of these before....but I painted the bases in black.....so cute with the pale pink ribbon.......but, hey! Whatever makes you smile! Don't forget to come back for the 100th post giveaway.....COMING SOON!! PS........Daughter crash update: DD got an attorney today. It was just too stressful for her to try to do it all herself. She's a bit of a worrier....could she have gotten that from me?......NAHHHH.... She's decided to have the work done on the car, then trade it in on something else. Apparently she has something in her auto policy called diminished value. The insurance company will pay her the difference between the wrecked value and the pre-wreck value.....gotta love that! Thank you soooo much for all of your concern and good tips! Oh Spencer that is adorable, I wanna try, I wanna try!!! Thanks for showing me how, now I'll be on the lookout. Yours is pretty!! Love the pink! Happy Pink Saturday! Oh Spencer, the candle stick is darling, I can't wait to try one. Now to the external harddrive, I don't know how to make it work. Can you send me ten easy steps that anyone can understand? I constantly worry about car crashes. I am so glad to hear that no one was hurt. Wow, what an absolutely fabulous tutorial! Thank you so much for sharing!!! That would look wonderful in my guest room! Well aren't you just too clever! That is the cutest little candle stick and you better know I'll be lining up to win. Hope all goes well with your daughter, not a fun thing to deal with. What a sweet tutorial! I love it! Thanks for sharing and Happy Pink Saturday to you. Enjoy your weekend. Beautiful, sugar. Very elegant, but I would expect that from you, honey!!! That is just the cutest ever. How clever. I am going to a few yard sales this morning. I will have to keep my eyes open for some bases and little cups. Things will work out for your daughter. These types of situations always have a way of working themselves out. I understand though about the worrying. That pesky thing called "worrying" can get in the way and it makes it difficult to even think straight. Spencer: Love the tutorial. I caught up on news and am so sorry about the accident. I lost my father the same way as your grandson did his. It is always in my mind. And, you daughter, oh my, my heart breaks for her. I do thank you for the tutorial and wish you a Happy Pink Saturday! and good week. How lovely! Thank you so much for the tutorial! You've made the sun shine for me on this Pink Saturday! Spencer, this is adorable & elegant. TY for sharing the 'how to' ... without the 'how to' I'd not have been able 'to'. So glad your daughter is going to be ok now. It always pays to come back with the car insurance companies, they just don't tell you anymore than they have to. Good luck. Thank you for this lovely idea. Your tutorial is perfect. Spencer that is just the cutest idea, I love the white and pink together. It would also look great with little pink flowers floating in the cup in stead of the candle. I will be checking back to see what you plan for the 100th. So cute. Hope daughter and grandson can put this behind them soon. Hi Spencer! What a cute idea for a candle holder! I LOVE it! Thank you for sharing this! Happy Pink Saturday, and hope you have a wonderful weekend! That's a great project that I may have to copy. 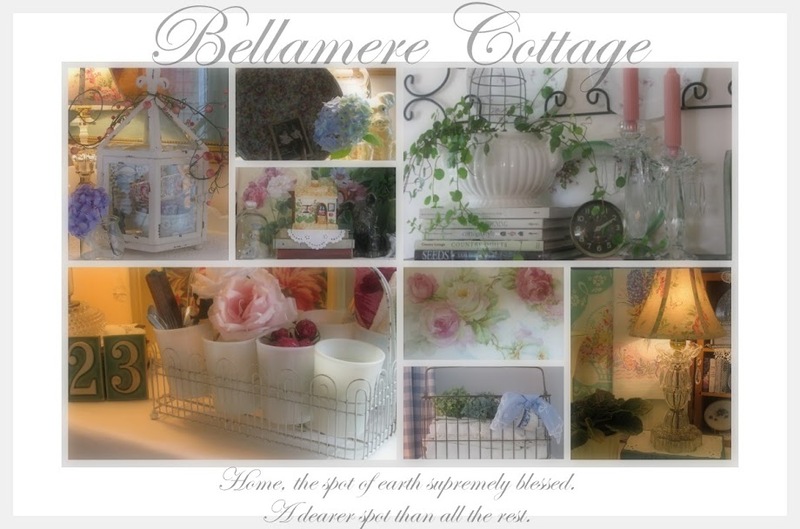 May I ask who painted your beautiful sign for Bellamere Cottage Est. ? The lettering is really beautiful. What a great project! Simple and really pretty. Hello Spencer! Thank you so much for your visit and for your nice comment! Your blog is very nice too and I see you are a very creative girl and I like this! How pretty! Thanks for the lesson and Happy Pink Saturday! Happy pink Saturday. what a cute tutorial!. What a wonderful little project. I want to make several to use in the garden when we eat supper there. Won't the flickering candlelight be pretty? Thank you for this sweet idea. My very best wishes go out to your dear daughter and grandson as they work through their ordeal. Well I just found you. And what a day to stumble upon you! I'm in love with that cute candle stick project! Love the tutorial! Thanks! 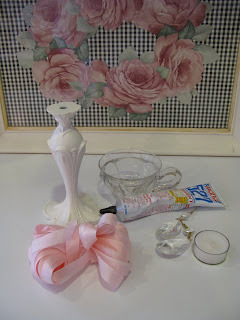 Beautiful tutorial...I love the candle stick. 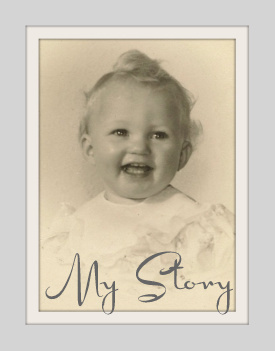 I have a reward for you on my blog. I continue to pray for your daughter and grandson. Dear Spencer - Thanks so much for the wonderful tutorial! So sorry to hear about your daughter's crash! Thank goodness they are both alright, but that must have been doubly stressful considering what they have suffered through in the past. 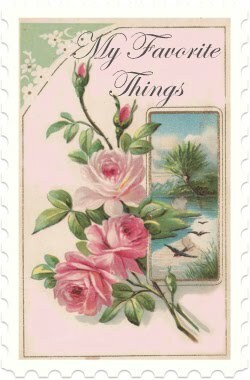 Lovely pink post! Thank you for sharing! I LOVE the candle holder! Oh i just love your votive holder!! Your are a crafty one! I am so glad your Daughter is getting something done with her car. Oh Spencer this is lovely!! Really shows your creativity and talent!! Thanks for the tutorial, I will give this a try!! So glad to hear that your daughter is doing better. Our kids mean the world to us. I'm sorry about the stressful and scary ordeal your daughter and grandson recently went through. So glad they are okay. I was just passing by and thought I'd leave a comment. I just loved your candle light project. I will definitely have to try that when I get all of the materials together. Thanks for that cute idea. Spencer, what a beautiful blog you have here! Next time I'll make some tea and stay awhile longer! I too love all things English and have named our home as well. We live on Marigold Circle so it just came to me one day . . . Marigold Manor! I even had a plaque made up and it sits over our front door. I'll post it in my blog to share with you! I love the tea light tutorial! I forsee a shopping trip to the Goodwill for me! Thanks so much for sharing! Thanks so much for visiting my blog and leaving your kind comments! Hello Spencer, thanks so much for visiting my cottage and for leaving such a sweet comment. I love your blog, I had to glance at it quickly because I am late for work, and however, I am coming back tomorrow to read your current and archived posts. To start with I love the name you gave your cottage and you are right about the British!! Quickly looking I can see love throughout your blog, love of family, all things beautiful and the world. I am impressed; therefore, I sign up as a follower and will link your site to my blog (which is on a separate page and you can enter by clicking on the blue door located at the top right hand corner). Spencer, please drop by for a visit again, I will love to have you over for tea, and next time, if you have a moment, please join my followers, I will sincerely appreciate it. 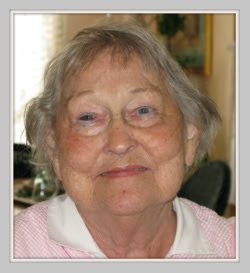 Just found your blog and it is lovely. That is a wonderful candlestick. I can't wait to make one with a glass teacup. Thanks. Hi dear! I am going to try this project! I'll run over to Lowes for the prisms...I hope they have them! Cute idea to put some bling around the house. Happy Pink Saturday. My first visit to your post. I think you do a super job and I enjoyed my visit with you. Too, I am always pleased when someone takes the time to visit me. When we lived in Spain they named their houses too...we lived in one near the ocean called Estrella del Mar...Star of the Sea. Thanks for sharing that wonderful project ! My DD went through a similar experience as yours, unfortunately she didn't receive the value for her car we felt she should have...but all turned out well. Oh, I love that! I'd like to try to make something like that sometime. Hi Spencer! It's so very nice to meet you! I'm glad you've popped in to see me and I'll be coming back to see you for sure! Please know I've entered your tiny name in my giveaway! Thanks for the beautiful tutorial! 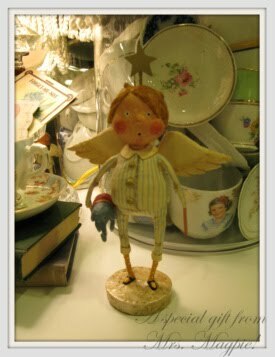 :o) I love it, and must make one for me soon! :o) What a beautiful place you have here and such a pretty Pink Saturday! :o) The glow of the candle is just beautiful. :o) I am always excited when I find another warm and wonderful place to visit. By the way, I love the lovely photos on your sidebar, beautiful indeed. :o) Thanks so much for dropping by to say hello. You and your family enjoy a beautiful coming week. Great idea and it is SO CUTE! Thank you for stopping by my blog the other day and especially thank you for leaving a comment...comments are always appreciated! Your candlestick is ADORABLE and looks like something I could even tackle! Thanks for the great tutorial. very creative of you and great end result! thanks for the tutorial! The candlestick is really cute! What a lovely outcome, Spencer! This looks so high end and you could probably make some serious cash selling these!! Too cute!! You are just so talented, my dear!! Hope you have a wonderful week. Thanks for the update on your daughter, too. SO glad she's ok!! Oh my!!! I LOVE this pretty!!! !Will make one soon! I just adore that pink seam binding...it is my fav too! 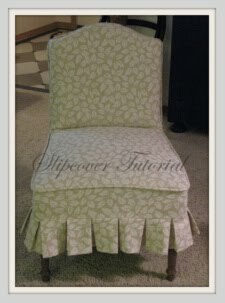 I have fallen in love with that seam binding, use it often, too. Thanks for the update on your daughter. Ahhh, YES~ "Diminshed Value" is offered in alot of states, but you usually have to inquire about it...it sure does help, though! So, did you prime your candlestick then paint it? I'm guessing you used a thick glass for the candle so as not to break it with candle going. And you just glued it straight to the candlestick top? The paint did not peal off causing the cup to come off? I have had that happen before. Thanks for showing us your cute project. Love the painted floor and counter on your sidebar. 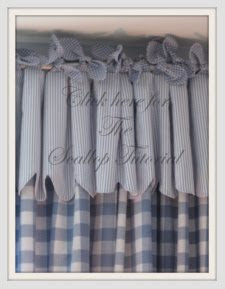 I love tutorials Spencer, Many thanks for sharing, NOw, why did I never think of Punch Cups, I have two bowls with them in my garage, maybe 24 of them, I better get busy! WOW!!!!!!!!!!!! That is too good to be true! So easy but so beautiful!!! I must must try this....running to the GW very soon to give it a try! Thank you so much for sharing!